Look ma, no pants! | Drake in D.C.
Coming from small town Iowa, there are bound to be instances of culture shock in Washington D.C. This could be the woman chasing you around the grocery store asking for money or food trucks on every corner, something you’ve only seen before at the state fair, but most of all there is the metro system. For the average citizen in the city public transportation is a part of everyday life. Using the metro trains is not something I particularly enjoy, but I have grown accustomed to this form of transportation and am left fairly unphased by the process. That is until this afternoon. On my metro ride back to The Washington Center I looked up to see a man dressed in a suit, well, a partial suit. All he was missing were his pants. I could do nothing more than stare at his batman boxers and wonder if he been running late this morning or spilled hot coffee on himself. My perplexity would increase as we got to the train station. Waiting on the platform for the final train home I encountered an entire group of men, women and children walking around in their undergarments. This ruled out the accidental coffee spill, leaving me stumped. A group of people in their underwear is not the most approachable gathering, so I turned to google for answers instead. Today is the Thirteenth Annual No Pants Subway Ride. The event has a News York City origin, but it has spread to include more than 60 cities in the U.S. and 25 nations around the world. This years’s ride came on Sunday, January 11. To get involved, you must simply get dressed as you normally would, but leave off the pants to parade around the subway in your undies. Once on the subway all participants carry on as normal. There is no bigger purpose behind the event. It’s seen as just a fun and silly subway ride by those involved. I was so in awe I couldn’t help but sneak a few pictures of the incident, because pics or it didn’t happen. The experience left me thinking about culture shock and how much influence the environment we were raised in affects our actions, opinions and beliefs about the world. Brought up in a conservative household, my ideals have aligned me with the Republican Party. This has shaped my beliefs on social behavior as well as beliefs pertaining to key political issues. To some, activities such as no pants day are quirky release. I, on the other hand, am the size zero who still feels insecure in a bikini on more appropriate occasions. The insecure part of me applauded these individuals’ self confidence. 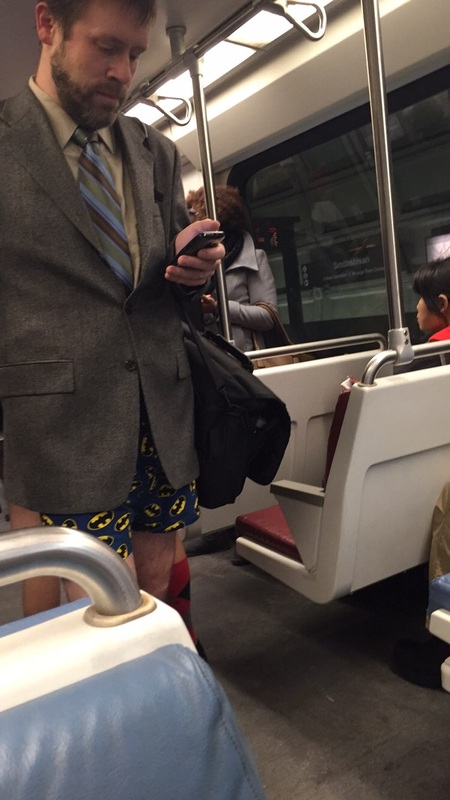 2015 No Pants Subway Ride participant. The conservative part of me wanted to offer them money for pants. Programing this week has been aimed at bipartisanship. To instill the idea in us, we have heard from speakers of both parties with messages we don’t always agree with. As we all know, the conflicting ideas of our political parties leave little wiggle room for mutual policy visions. Hearing the other side of the argument none of my opinions shifted. I bring this up to demonstrate that the difficulty of compromise comes in a mutual unwillingness to waiver. While respecting opposing views is all part of the game, persuasion is rarely an easy feat. Listening to an hour of differing beliefs generally won’t be enough to substantially shake the core values and beliefs that have been fostered for years. These ideals are the product of your environment. Growing up to believe in an economic system where businesses are under control of the private sector (healthcare included), these ideals have stuck with me, as did the social courtesy of never leaving the house undressed. Maybe I’m over simplifying a complicated principle, but to me policy ideals are just as wide-ranging as the fashion choices of the citizens they affect. Just as my beliefs make me favor a less involved government, they guide me to keep my pants on in public.